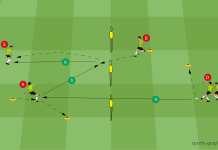 In this exercise, players will learn to vary the accuracy of their passing. 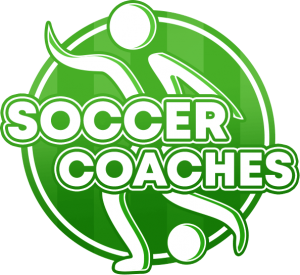 This promotes the interaction from defense to the strikers. A sharply played ball is played back to a teammate (Through Passing), who then passes the ball into the running lane of another player. A passes to B and sprints towards E.
B passes sharp to C and takes the position of A. 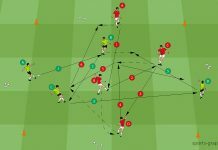 D passes sharp to E.
E passes back to A and heads towards F.
A passes directly to F and runs to position E.
F drops the ball to E and sprints towards I.
E passes sharply to G and moves to position F.
G drops the ball to H.
H passes sharp to I.
I drops the ball F.
F passes diagonally to B, who has taken the position of A. Etc. 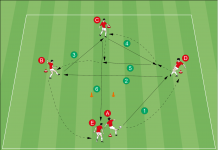 The exercise starts simultaneously with 2 balls at position A and F.
The two players in the middle (C and D and G and H) change position after each pass.